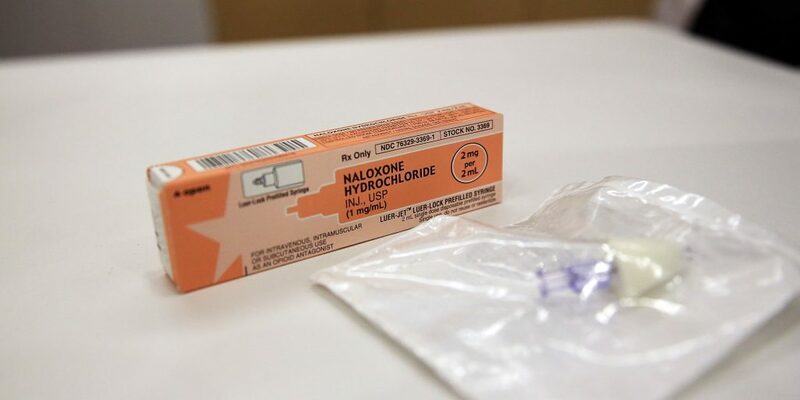 A box of the overdose antidote Naloxone Hydrochloride sits on a counter. Photo by Spencer Platt/Getty Images. Multiple Connecticut mayors have joined forces to ensure that they will be able to seek damages from companies fueling the opioid epidemic. The mayors of New London, New Haven, Wallingford and New Britain will be co-chairing the Connecticut Opioid Strategy Taskforce (COST), a bipartisan coalition that will advocate for the Opioid Accountability Act, which would allow such damages to be sought, according to a COST news release. Other Connecticut professional associations, treatment providers and child welfare advocates are joining the coalition. “Connecticut municipalities are simply asking, as are the hundreds of other municipalities across the country that have filed suit, that the drug companies and pharmaceutical executives who made billions in profits, while leaving devastated communities in their wake, be held accountable,“ Mayor Stewart said in the news release. Dozens of municipalities in Connecticut have filed lawsuits seeking compensation for the damages that overprescription and abuse of opioids have caused, according to Hartford Business. About 47,600 people died from opioid-related drug overdoses in 2017, according to the Centers for Disease Control and Prevention. Moreover, local and state governments have said that they’ve had to pay for opioid addicts’ medical and social needs, the Associated Press reports. However, Justice Thomas Moukawsher of the Hartford District Superior Court dismissed opioid drugmaker-related lawsuits from 37 municipalities in January, ruling that they weren’t filed as government enforcement actions that were authorized by state law, according to the AP. “It is fundamentally unfair that Connecticut is the only state where taxpayers are forced to bear the costs of the opioid epidemic with no ability to seek recourse from the wrongdoers. And even if the state eventually reaches a settlement in its suit, there is no guarantee that the monies will find their way back to our communities,” New Haven, Conn. Mayor Toni Harp said, according to the news release. “The only way to guarantee restitution on a local level is for our municipalities to sue on our own behalf,” Harp added.